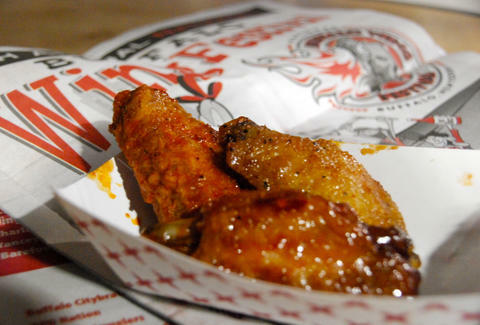 In Buffalo, NY, the wing is always king. 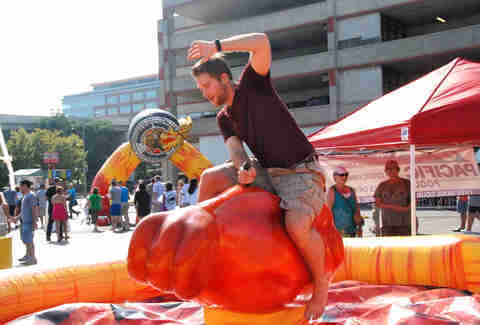 But it's never kinglier than on Labor Day weekend. 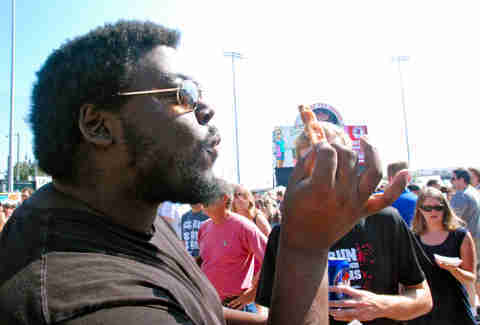 For the last 12yrs, drumstick fiends from more than 35 countries and almost every state (where you at, Idaho?!?!) 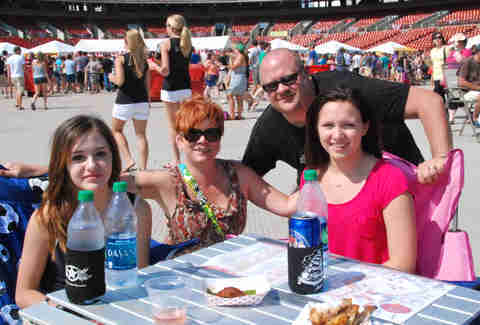 have flocked to Buffalo’s Coca Cola Field to burn their tongues off at the National Buffalo Wing Festival. 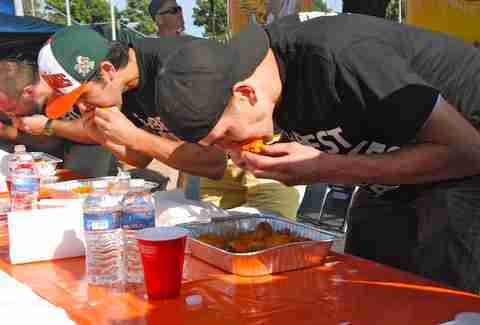 So naturally we went, and documented the madness that only 40 tons of buffalo wings in one place can create. Here's what happened. The entrance to Wing Xanadu. 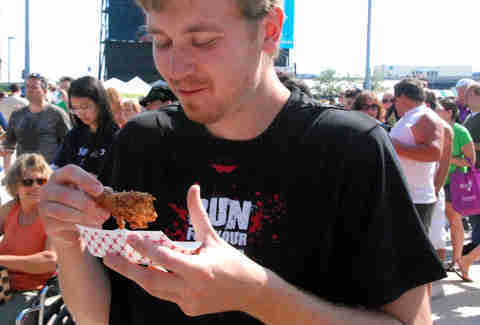 Wings were a buck apiece, to ensure that people could just go insane on tasting everything from classic Frank's-covered, to more inventive stuff like peanut butter and jelly wings. More on that soon. These are from Georgia's RuChDa. Buffalo's Bocce Pizza tossed their wings on the grill, for extra char. 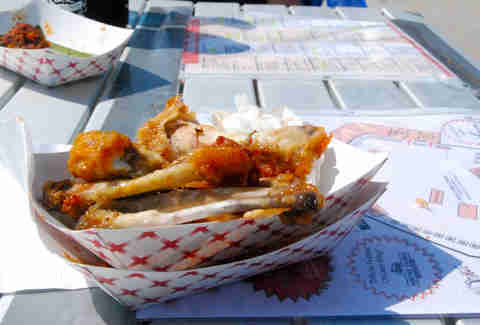 And of course, there were wing-offs. Check out the below video to see each in their brutal consumptive fury. Here're the pros of the Buffalo Buffet Bowl, downing two slices of pizza, two beef on weck sandwiches (another Buffalo original), and a pile of boneless wings. 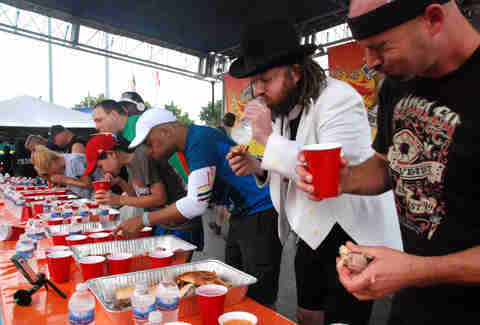 From right: Steve Hendry, Crazy Legs Conti, Yasir Salem, Sonya Thomas, Joey Chestnut, Eric “Badlands” Booker, and Miki Sudo. 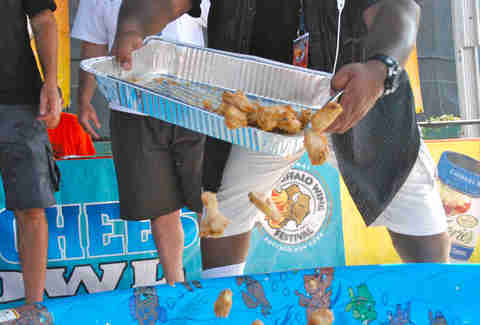 And because eating at insanely high speeds with your hands is never messy enough, Buffalo ratcheted up the action with a wing-bobbing contest, in which a kiddie pool was filled with chunky blue cheese and wings were hidden for the finding. "You’ve got to bring goggles," Galarneau said. "Because that stuff stings." 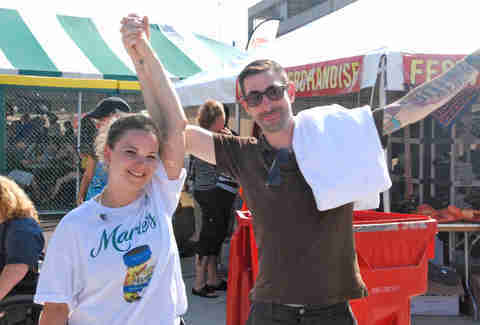 Your winner, in all ways: Sarah Parkington of Chicago, IL. See, winner! And the only girl in the contest. 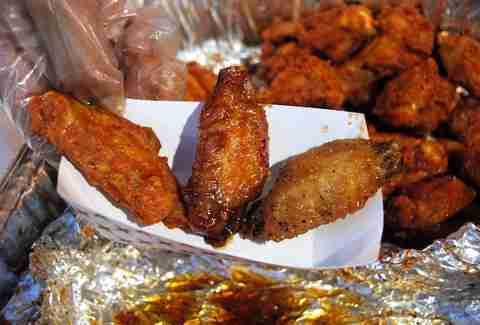 She dug out 57 percent of the wings, which you of course know is a new record. 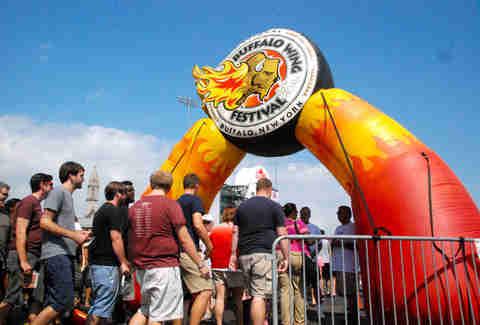 Buffalo News Food Editor Andrew Galarneau, and plenty others, will tell you that in order to be a true “Buffalo” wing, a vinegar-based pepper-hot sauce has to be used. 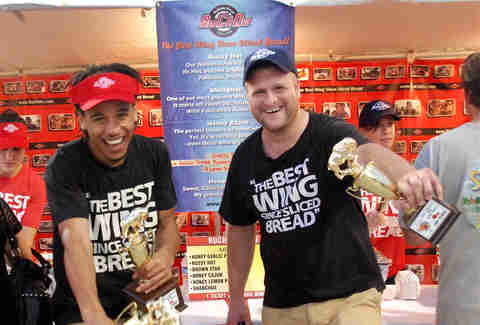 These guys don't care about that, as proven by their trophies for best original sweet sauce. “For the purist, it comes down to the butter versus margarine question," Galarneau says. "If you’re going to risk clogging your arteries anyway, why go half way? A little vegetable oil emulsified with water, you think that’s going to make your chicken wings better? I don’t see how that’s possible." 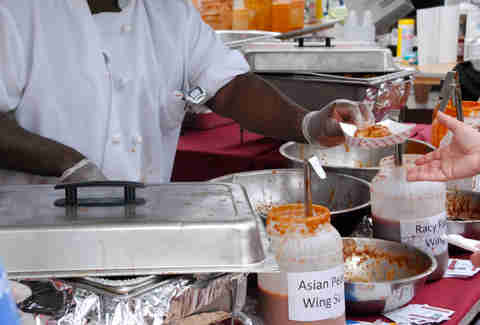 Although Frank’s was the original hot sauce, he's no stickler, as long as the flavor is good. "You don’t have to use Frank’s. 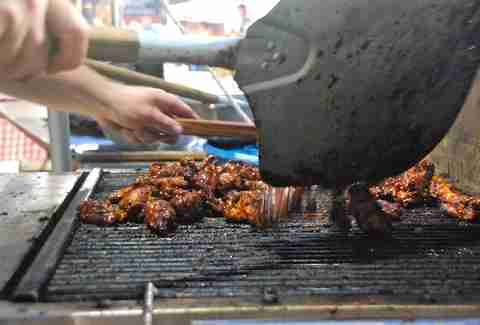 Some of the delightful varieties of Buffalo-style wings that do exist, exist because people are willing to tinker within the formula. 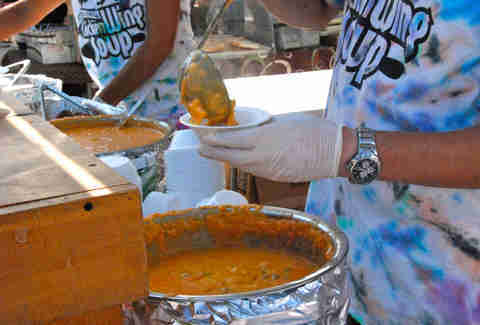 You need a bracingly sour chili-laced flavor in there for it to be under Buffalo-style." Get this: Chicken Wing Soup. The Puchala family of Rochester, NY -- who are 11yr-vet Wing Fest attendees -- brought a card table, lawn chairs, and most importantly, a laminated, highlighted schedule that they taped to their table to ensure they didn't miss anything. Abigail’s Restaurant of Waterloo, NY took care of that via innovative flavors like Spicy Asian Peanut, Peanut Butter and Jelly, Hot Raspberry, and Hot Chocolate. Kaufman handed off the hot chocolate to Tim Kilber of Westminster, MD, who had traveled to Buffalo for his bachelor party. 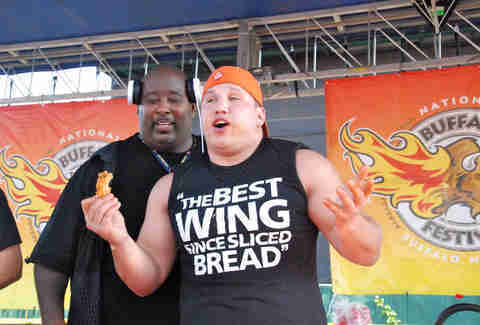 A wing lover and former Buffalonian, he decided to celebrate his last few hours as a free man with grease, cheese, beer, and 11 of his closest friends. The hot chocolate wing, he decided after careful deliberation, was not living up to the occasion. Badlands digs the shirt, bro. And yes, that is a mechanical wing.